For the Italian wine grape known as Saint Emilion, see Trebbiano. 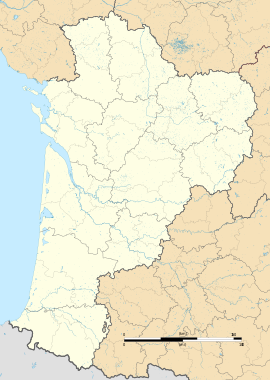 Saint-Émilion (pronounced [sɛ̃t‿e.mil.jɔ̃]; Gascon: Sent Milion) is a commune in the Gironde department in Nouvelle-Aquitaine in south-western France. Saint-Émilion is located 35 km (22 mi) northeast of Bordeaux, between Libourne and Castillon-la-Bataille. Saint-Émilion is one of the principal red wine areas of Bordeaux along with the Médoc, Graves and Pomerol. The region is much smaller than the Médoc and adjoins Pomerol. As in Pomerol and the other appellations on the right bank of the Gironde, the primary grape varieties used are the Merlot and Cabernet Franc, with relatively small amounts of Cabernet Sauvignon also being used by some châteaux. Saint Émilion wines were not included in the 1855 Bordeaux classification. The first formal classification in Saint-Émilion was made in 1955. Unlike the 1855 classification, it is regularly revised. Since 2012, Saint-Emilion hosts a Jazz Festival at the end of July. ^ "The Monk Émilion". saint-emilion tourisme. Retrieved Sep 30, 2018. ^ "Bordeaux". Catholic Encyclopedia. Retrieved Sep 30, 2018. ^ "Saint-Emilion Jazz Festival - Site Officiel | Éditions passées". www.saint-emilion-jazz-festival.com (in French). Retrieved 2018-08-02. Wikimedia Commons has media related to Saint-Émilion. This page was last edited on 30 September 2018, at 12:12 (UTC).